Tickets for the “One Book, One UIS” presentation featuring civil rights icon and U.S. Congressman John Lewis are now available free of charge to the general public through the UIS Sangamon Auditorium Ticket Office. Lewis will speak at the auditorium on Monday, October 19 at 7 p.m. along with co-author Andrew Aydin and illustrator Nate Powell. The graphic memoir, MARCH, which tells Lewis’ life story, has been chosen by UIS as the campus community read for the 2015-16 academic year. The program, “MARCH: The Struggle for Racial Equality and Social Justice”, is supported in part by Illinois Humanities and the Field Foundation of Illinois. Other sponsors include the UIS Chancellor’s Office, Friends of Brookens Library and the UIS ECCE Speaker Series. 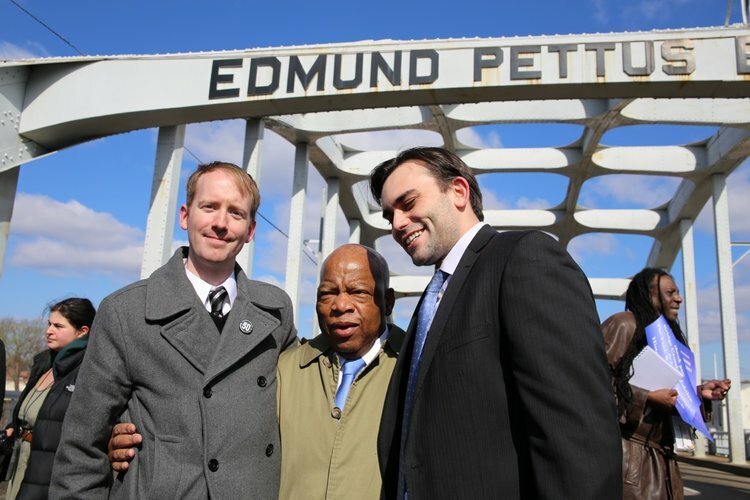 The title of the book MARCH comes from the many marches that Lewis organized or participated in, including one of the most well-remembered moments in civil rights history—the march over the Edmund Pettus Bridge in Selma, Alabama on March 7, 1965. Lewis was one of the organizers of the march, which drew nationwide attention when the non-violent marchers were attacked by Alabama state troopers. Many historians believe that the images of cruelty from the Selma march were a factor in the passage of the Voting Rights Act of 1965. Lewis has been a member of the United States House of Representatives since 1986. Born the son of sharecroppers in Pike County, Alabama, he became a civil rights activist while a student at Fisk University in Nashville, Tennessee, organizing sit-ins and participating in freedom rides. From 1963-1966, Lewis chaired the Student Nonviolent Organizing Committee (SNCC) of which he was a founder. Over the years, Lewis has received many prestigious awards, including the Medal of Freedom, the nation’s highest civilian award. He was recently presented with the Paul H. Douglas Award for Ethics in Government from the University of Illinois Institute of Government and Public Affairs. Co-author Andrew Aydin currently serves in Representative Lewis’ Washington, D.C. office handling telecommunications and technology policy as well as new media. He previously served as director of communications and press secretary during Lewis’ 2008 and 2010 re-election campaigns. Nate Powell is a New York Times best-selling graphic artist whose work includes the critically acclaimed, award-winning Any Empire, Swallow Me Whole and three other books. He is currently drawing the graphic novel adaptation of Rick Riordan’s #1 bestseller Heroes of Olympus: The Lost Hero. MARCH is planned as a three-volume trilogy. At UIS, we are reading volumes one and two. MARCH: Book One has received numerous awards, including a 2014 American Library Association (ALA) Coretta Scott King Author Honor Award and an ALA Notable Children’s Book designation. It made the “best books of 2013” lists of USA Today, The Washington Post, Slate and others. MARCH: Book Two has just been published and has already garnered a starred review from Kirkus Reviews. This is the second community grant that UIS has received from Illinois Humanities to bring authors with important public policy messages to the campus and the Springfield community. Members of the public may obtain free tickets by visiting the UIS Sangamon Auditorium Ticket Office, located in the Public Affairs Center on campus, or by calling 217/206-6160 or 800/207-6960. Charges may apply for those who choose to have tickets mailed to them. You must have a ticket to be admitted to the event. For more information about the “One Book, One UIS” community read, the event on October 19 and related events, visit www.onebookoneuis.com.